More than just a stunning event space, The Dekker Centre offers inspired and entertaining options you won’t find elsewhere. That’s why we are teaming up with some amazing local businesses to create the opportunity of a lifetime! We want to help you create your dream wedding, here, at the Dekker Centre for the Performing Arts. That’s why we are so excited to announce the Win Your Wedding Contest: a package valued at over $5000.00! Gift Certificate of $200.00 and a Beautiful Kimono to Get Ready in on the Big Day! 3) The Dekker Centre is only covering the full price of your venue rental, and the sponsors of the Win Your Wedding contest are only giving gifts of certain amounts towards the wedding. The couple will be expected to pay for anything that goes above and beyond what the Dekker Centre, and the other sponsors have given. 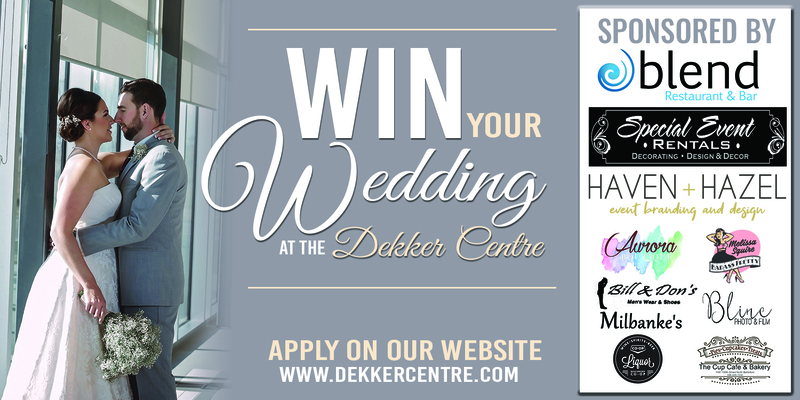 4) This contest is not applicable for couples who have already booked their wedding at the Dekker Centre. 5) The Win Your Wedding contest winners can be married at the Dekker Centre on any available date between July 1, 2019 and June 30, 2021. 6) The bar sales belong to the Dekker Centre; and the Dekker Centre takes on the responsibility of supplying the liquor and the staff to run it. Contest closes on March 31, 2019. The winners will be notified by April 15, 2019! Email us at: winyourwedding@dekkercentre.com for more information!